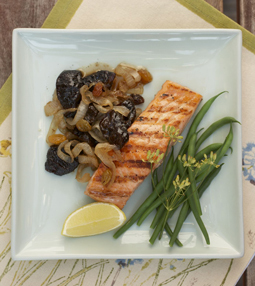 Grilled Salmon with Onion and California Dried Plum Compote - A recipe from Savor California, the online showcase for extraordinary gourmet foods and beverages from California. In large skillet, heat oil over medium heat. Add onions; season with salt and pepper. Cover and cook about 5 minutes or until onions are soft but not colored. Stir in dried plums, raisins, vinegar, sugar and ginger. Cook, uncovered, about 15 minutes or until onions are completely soft and compote is golden brown. Keep warm or store in refrigerator and heat in saucepan over low heat when needed. Grill salmon over gas or charcoal grill until a sharp knife feels no resistance when pushed into the salmon. Serve with compote on the side.